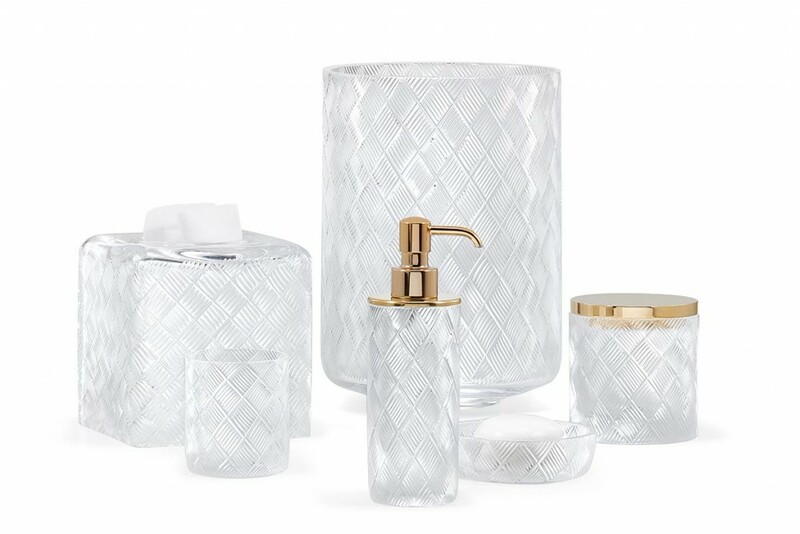 I’m very excited to be showing the latest additions to The Roger Thomas Collection next week at Milan’s Salone del Mobile: A new line of bathroom accessories. Most bathroom vanities are a jungle of personal grooming products and apparatuses. So I’m offering a chance to combat the clutter with my favorite design weapons: Beauty. Drama. Romance. Surprise. I’m delighted to have collaborated with the perfect partner for this effort, Labrazel. They are well known for producing exquisite pieces in small workshops in Italy and around the world, where artisans use skills passed down through many generations. Together we’re offering tissue-box covers, soap dispensers and dishes, brush holders, canisters, trays, and waste baskets – functional accents that I hope can elevate the daily experience from a minor form of chaos to a peaceful and organized daily ritual. 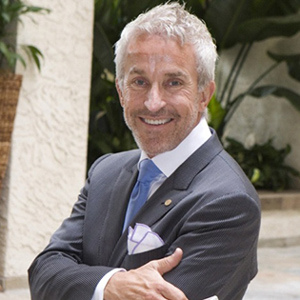 I’ve used dramatic sculptural elements and fine materials to make a strong first impression of elegance. I’ve been looking for accessories this special for my whole career, but only Labrazel has been able to realize them with the craft and attention I demand! Several more exciting collections are currently at the artisans’ workshops. The new designs will include hand-painted verre eglomisé and hand-tooled, burnished brass. 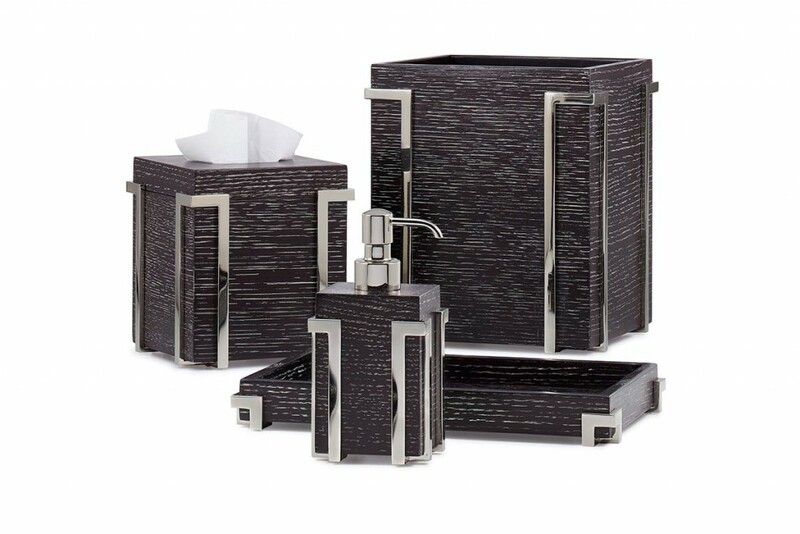 The Roger Thomas Bath Accessories Collection is offered in select luxury retail locations worldwide, through the interior design trade, and online. BASKETWEAVE: A classic basketweave pattern in crystal. These mouth-blown, hand-cut pieces are very difficult to produce, requiring artistry at the cutting wheel and meticulous finishing. 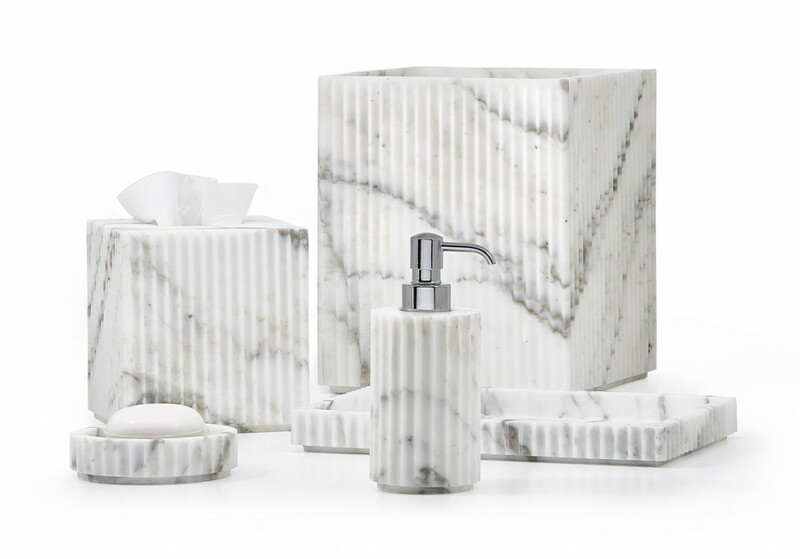 ACROPOLIS ARABESCATO: made of distinctive, dramatic Arabescato marble, the fluted carving is a homage to the classic simplicity of ancient Greek architecture. Each piece is carved by hand from single blocks with a “levigato” (honed) finish. 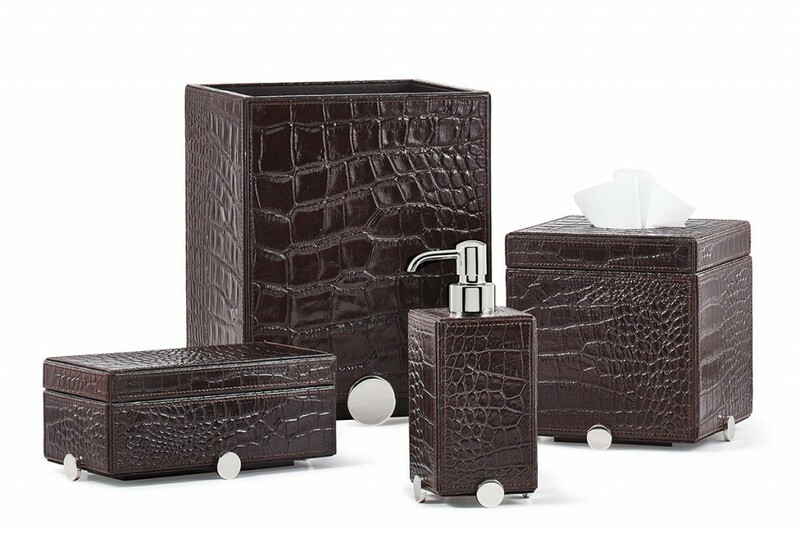 DISCUS: These fine leather accessories are embossed with a classic crocodile pattern and accented with gleaming chrome discs. EMBRACE: Cerusé finished hardwoods are held in a polished metal embrace.